Drawing on political, legal, national, post-national, as well as American and European perspectives, this collection of essays offers a diverse and balanced discussion of the current arguments concerning deliberative democracy. Its contributions' focus on discontent, provide a critical assessment of the benefits of deliberation and also respond to the strongest criticisms of the idea of democratic deliberation. The essays consider the three basic questions of why, how and where to deliberate democratically. This book will be of value not only to political and democratic theorists, but also to legal philosophers and constitutional theorists, and all those interested in the legitimacy of decision-making in national and post-national pluralistic polities. 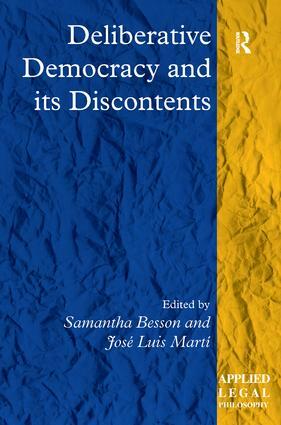 Contents: Introduction, Samantha Besson and José Luis MartÃ­. Part I Why Deliberate: Is the ideal of a deliberative democracy coherent?, Cristina Lafont; The epistemic conception of deliberative democracy defended - reasons, rightness and equal political autonomy, José Luis MartÃ­; The value added by theories of deliberative democracy: where (not) to look, Andreas Follesdal. Part II How to Deliberate: Democracy and the real speech situation, David Estlund; Depoliticizing democracy, Philip Pettit; Conflict and self-interest in deliberation, Jane Mansbridge; Framing public deliberation and democratic legitimacy in the European Union, Deirdre Curtin. Part III Where to Deliberate: The people in deliberative democracy, Francis Cheneval; Deliberative demoi-cracy in the European Union - towards the deterritorialization of democracy, Samantha Besson; Institutional reform and democratic legitimacy: deliberative democracy and transnational constitutionalism, James Bohman; Should deliberative democrats defend the judicial enforcement of social rights?, Roberto Gargarella. Index. Samantha Besson is Professor of Public International Law and European Law at the University of Fribourg, Switzerland. She is currently leading an interdisciplinary research project on the legal and political theory of European integration supported by the Swiss National Science Foundation. Previously, she held a research position at Oxford University and a senior lectureship at the University of Geneva European Institute. Her publications and research interests lie in constitutional and democratic theory with a special emphasis on global justice and post-national institutional design. José Luis MartÃ­ is PhD in Political Theory and Associate Professor of Law, Pompeu Fabra University, Barcelona, Spain. He is mainly interested in theories of democracy, republicanism and theories of justice. He has published extensively on deliberative democracy and republicanism. A sample of his work may be found in L. Wintgens (ed. ), ’The Theory and Practice of Legislation’, published by Ashgate (2005). The principal objective of this series is to encourage the publication of books which adopt a theoretical approach to the study of particular areas or aspects of law, or deal with general theories of law in a way which is directed at issues of practical, moral and political concern in specific legal contexts. The general approach is both analytical and critical and relates to the socio-political background of law reform issues. This series includes studies of all the main areas of law, presented in a manner which relates to the concerns of specialist legal academics and practitioners. Each book makes an original contribution to an area of legal study while being comprehensible to those engaged in a wide variety of disciplines. Their legal content is principally Anglo-American, but a wide-ranging comparative approach is encouraged and authors are drawn from a variety of jurisdictions.